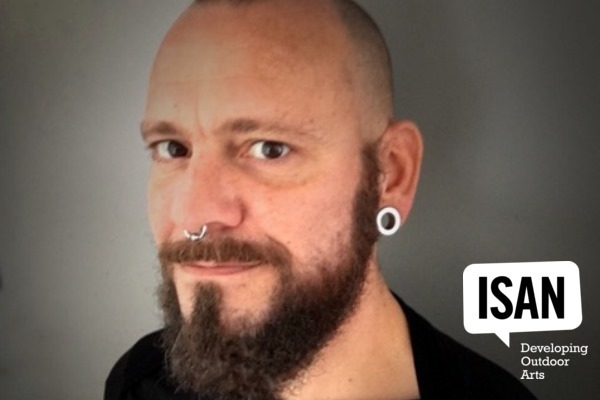 Home › UK Arts News › ISAN September Outdoor Arts News Idea Summit Date | Extraordinary Bodies Partnership | Bingo, bingo, bingo – Daryl Beeton’s in the spotlight! ISAN September Outdoor Arts News Idea Summit Date | Extraordinary Bodies Partnership | Bingo, bingo, bingo – Daryl Beeton’s in the spotlight! 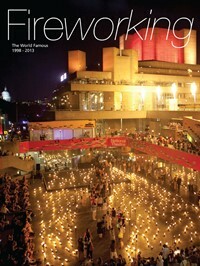 Welcome to the September Outdoor Arts Newsletter, coming at the end of a hugely busy month for the Outdoor Arts sector. Get 28/29 October 2016 in your diaries now for the Ideas Summit 2016 – an excellent ideas generation and networking opportunity in Bradford. We're thrilled to be partnering with The Brick Box for this event and grateful to the Arts Council for their support. More details below. ISAN has been visiting numerous festivals and it has been brilliant to see so many wonderful shows and audiences; both Natalie and I went to Stockton, where the very full line-up included a tsunami of shows by Avanti Display alongside Motionhouse and NoFit State's 'Block', Circus Geeks and PanGottic's 'Project Vee', Kazzum, Les Enfants Terribles, The Chipolatas (or Chiplatios), Acrojou, Candoco Dance Company and 'Furious Folly', the powerful 1418 Now piece about 'deserters' in the First World War which was developed by the Corn Exchange and the 101 Creation Space. Next up, I attended Theater Op De Markt in Belgium with lots of UK shows from Company Chameleon, Plunge Boom, Gandini Juggling, Artizani and, once again, 'Block'; also XTRAX hosted a pleasingly well-attended UK artists' pitching session for our European friends. Then up at Wild Rumpus' Just So Festival, I saw muddy appearances by Corey Baker Dance, HandMade Theatre, About Now-ish, Les Enfants and the return of Bash Street Theatre. An impromptu canalside cycle to Stoke took me to the Taster Tour for Appetite's Big Feast, where 2Faced Dance and Artizani nobly battled with downpours. Up at Lakes Alive in Kendal, Natalie met various members to talk about digital work, as well as seeing Ella Good and Nicki Kent's 'Total Eclipse of the Head', Highly Sprung's 'Urban Astronaut' and the new digital experience 'Bird Hive' in an idyllic Lake District setting. Meanwhile, I headed to the very friendly Festival Spoffin in Amersfoort (although the ambitious 54km cycle to and from the festival from Amsterdam meant sore legs for the duration); the UK was well represented by Joli Vyann and Mimbre and we were all made very welcome by Alfred, Casper and the team; of the international shows there, HURyCAN's new high-risk, high-skill acro four-hander (pictured above) was a standout hit and can be seen this weekend at Hull Freedom Festival – highly recommended. Looking ahead, ISAN's On the Road series heads to Derby and Llandudno at the end of the month, see below for details and booking; and thanks to our most recent hosts: Jan Doherty at Stockton International Riverside Festival and Sarah Allen at Lakes Alive in Kendal (and sorry about the venue confusion, our error!). I'll be visiting Right Up Our Street's DNweekeND in Doncaster, followed by the Freedom Festival and feeling the heat of GreatFire350 in London. ISAN is hosting a marketplace stand to promote the UK Outdoor Arts sector in Fira Tàrrega. Then it's the Out There Festival in Great Yarmouth, preceded by the SeaChange symposium and the XTRAX Shorts session. Then it's our visits to Derby Festé and Llandudno Arts Weekend. On Tuesday, I'll be going to the House of Commons, giving evidence to a DCMS Select Committee for the Countries of Culture Inquiry, touching on many topics including the place of Outdoor Arts in collaborations and partnerships, links to education and participation, the importance of our work in both place making and cultural tourism and the challenges of accessibility and diversity in the sector… and I'm very much looking forward to sharing our findings with them. Below you'll find some more funding success and a brand new – and rather amusing – ISAN Member in the Spotlight article with Daryl Beeton just before he premières his new show at the Liberty Festival this weekend; there are details of the line up for the SeaChange Arts symposium and our extensive Outdoor Arts listing; let us know any tips for shows, events, opportunities and festivals that we have missed. 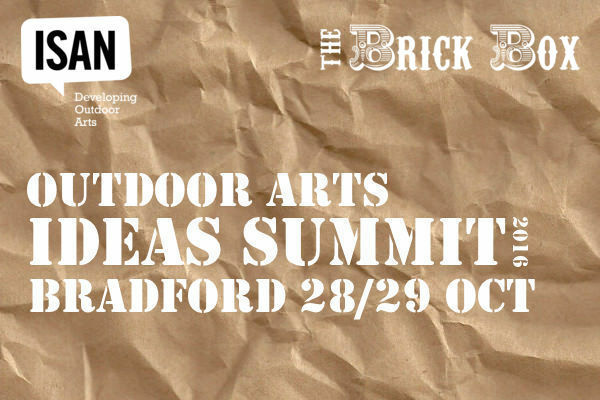 We're delighted to announce that we have joined forces with ISAN Members The Brick Box to present the Outdoor Arts Ideas Summit 2016 on 28/29 October in Bradford. And we're pleased to have been successful in a joint Arts Council England Grants for the Arts bid to take this year's edition to the city in West Yorkshire, where Rosie and Eleanor – the 'Brick Box Ladies' – have ambitious plans to transform Bradford's cultural life. This bid also includes some enterprising local work to bring more Outdoor Arts to the Bradford community. The Ideas Summit is ISAN's annual pitching session for artists to present ideas for new projects at early stages in their development and begin to seek commissioners, partners, collaborators, potential bookings and feedback. We'll have a keynote speaker to focus the event – and Angus will be on the stopwatch as usual. We have funding to cover artist's expenses and there will be some subsidised places for a number of emerging programmers and producers to attend. Applications to pitch and to attend will open later this month, so keep an eye on the ISAN website and our social media accounts for more details. Read the latest in our series of articles about members of the Outdoor Arts community. Days before his new show 'Bingo Lingo' premieres at the Liberty Festival, Daryl Beeton reveals his circuitous journey into Outdoor Arts via the Paralympic Opening ceremony, working with Graeae, Kazzum and the BBC… and how he likes to steal from children. Congratulations to Extraordinary Bodies on being awarded £719,322 from the Arts Council England Ambition for Excellence programme to realise their vision of becoming the national integrated circus company of the UK. Extraordinary Bodies was formed through a partnership between Cirque Bijou and Diverse City whilst creating work for the opening ceremony of the London 2012 sailing event. The award will enable the organisation to develop and produce an ambitious outdoor touring circus show of scale, featuring exceptional disabled and non-disabled UK artists.They will explore circus techniques and future co-production through an international residency, and will develop talented young disabled artists in partnership with major UK circus schools. 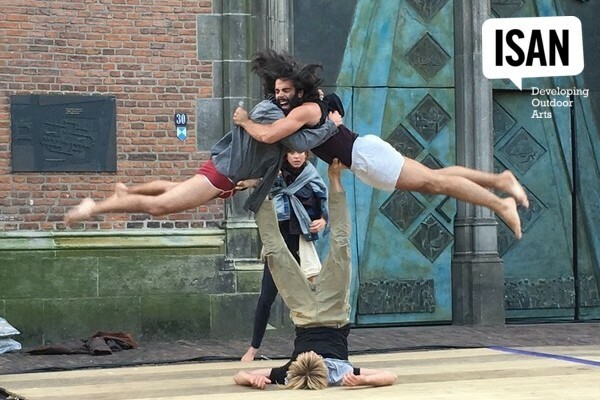 ISAN is proud to be one of the many partners on this project – which also include the National Centre for Circus Arts and Cirocmeida – and will be working on the sharing the findings and outcomes, leading sector events about integration performance aimed at programmers and producers across the cultural sector, and developing events as part of the ISAN Conference 2017 and the Extraordinary Ambition programme. ISAN Executive Director Angus MacKechnie will co-chair the Project Steering Group with Ayla Suveren. 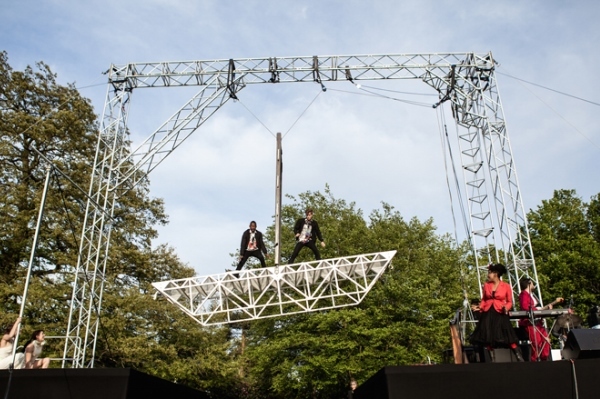 The steering group will comprise of producing partners plus significant leaders in theatre, outdoor and circus sectors. The role of the group is to advise, challenge and advocate for the project so work is relevant, affordable and makes real change. As one of the UK’s leading international collaborators, SeaChange present an engaging programme of debate and discussion exploring how the street arts and circus sector can continue to work internationally and collaboratively in today’s current economic and political climate. Europe’s leading producers, promoters and artists come together to navigate the challenges and explore new methods of reciprocal working. Join us in one of the UK’s most iconic seaside towns for an exciting programme of discussion, debate, networking and extraordinary Outdoor Arts. Alongside the symposium, the Out There Festival includes the XTRAX Showcase which includes artist presentations, groundbreaking UK work and quirky European street arts. This year, rather than asking you to come to ISAN, ISAN is coming to you. During the summer of 2016 we visit various festivals and events across the country, with a series of networking, information-sharing and discussion events for the Outdoor Arts sector. 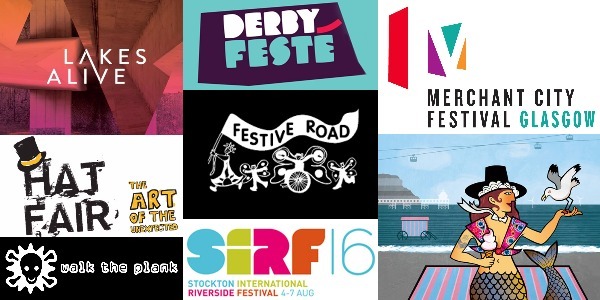 We've teamed up with a number of ISAN members, organisations and festivals, travelling to Manchester, Winchester, Milton Keynes, Glasgow, Stockton-on-Tees, Kendal, Derby and Llandudno. There will be some modest catering and a friendly atmosphere. ISAN Members, artists, producers and anyone with an interest in the Outdoor Arts sector is welcome to attend, and we're encouraging festivals to offer this opportunity to staff and volunteers, but if we're oversubscribed, we’ll give priority to ISAN Members. ISAN visits Derby and its very co-operative festival model for afternoon tea, networking and conversation; in association with Derby Festé. ISAN heads to Welsh seaside for the last Outdoor Arts networking event of the season at Llawn#4; in association with Articulture Wales. … as you can see from our gloriously branded young friends here! 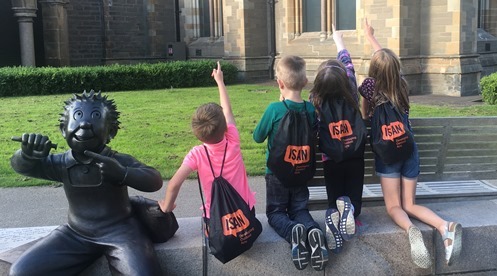 Join the ever-growing ISAN membership and, as well as a fantastic goodie bag, you'll get the exclusive Member Bulletins twice monthly, circulating news from the sector, funding, commissions, call-outs and employment opportunities… and sometimes a bit of gossip. A sumptuous visual celebration of the work of The World Famous: fifteen years of fireworks, fire and performance in one memorable book. With an introduction by Lyn Gardner of The Guardian, it traces the story of a unique collaborative company though breathtaking images, personal stories and recollections. 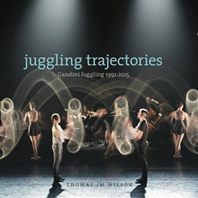 Thomas JM Wilson's book maps out the nature and growth of this pioneering and innovative company, covering the breadth of their diverse output, their spectacular outdoor events, virtuoso juggling to music, and theatrically-charged performances. If you need a bit of professional training, look no further than the Independent Theatre Council's excellent courses. The autumn programme is now booking. If you're an ISAN Member, remember you can book at reduced rates (details of how to access the discount are in the ISAN Members Bulletin). This list includes festivals, events, performances and programmes which have some element of Outdoor Arts; it also includes conferences, meetings and professional development events, plus the occasional indoor or non-sector event which relates to artists or other parts of the Outdoor Arts world. ISAN is the trading name of the Independent Street Arts Network. ISAN is not responsible for the contents, nor does it warrant the accuracy or reliability of, any linked website. ISAN, to the extent permissible by law, excludes all liability which may arise from your use or reliance on the information or contents contained in the linked site. Copyright © 2016 Independent Street Arts Network, All rights reserved. You are receiving this email because you opted in at our website. ISAN members receive a further x 2 emails a month with the latest in outdoor arts news and opportunities. To find out more about how to join ISAN, please follow the website link above.